What To Clean And Sanitize? The short answer is everything. Okay, I’d suppose you’d like to know more than that. You should clean all of your homebrewing equipment before you use it on brew day or bottling day. Then clean it again after you’re done. It may seem kind of redundant to clean it that much and no one I know likes the cleaning part of homebrewing, but the more often you clean your equipment, the easier it will be. With regular cleaning, there won’t be those stuck on dirty and debris that are a pain to clean off. You should sanitize anything that comes into contact with your wort after the boiling process. The boiling will kill any bad bacterias and germs, but after that it’s up to you to make sure that you’re protecting your wort from the bad guys. That means that you have to sanitize your wort chiller and fermenting bucket or carboy. If you transfer your beer to a secondary fermenter, you’ll need to make sure that it’s sanitized and anything that you use to transfer the wort is sanitized. And don’t forget that on bottling day you need your racking bucket, the racking cane, the bottles, the bottle caps and anything else that comes in contact with your beer has to be sanitized. How Do I Clean And Sanitize My Homebrewing Equipment? You can use the dish soap that you have laying around the house (just make sure that it’s unscented) to clean your equipment, but it’s not the best cleaner. With dish soap, you have to make sure that you thoroughly rinse the soap away or it can affect the taste and head of your beer in a not so awesome way. What many homebrewers use is PBW (Powdered Brewery Wash). PBW is a substance with a granulated texture and is mixed with hot water. You soak your equipment with the mixture for thirty minutes, then rinse it away. It’s some pretty impressive stuff, that can removes even stuck on dirt and debris. Most homebrew shops carry PBW. As far as sanitizing your equipment, you can use another household item – bleach. Most people have it already at their houses, but there are some down sides. It can get messy if you get it on to your clothes and you need to make sure you rinse it thoroughly so that it doesn’t get in to your beer. 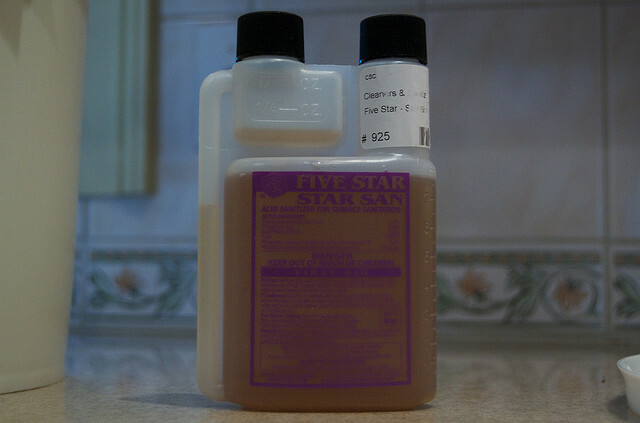 I recommend and what I use all of the time is Starsan. My favorite thing about it is that it doesn’t require being rinsed away, but it also foams up so that it gets into all of the crevices and other places the evil doing bacteria and germs like to hide. That’s what I suggest, what do you use to clean and sanitize your equipment?